The Langebaan lagoon is divided into two distinct areas. The southern end being where Langebaan is and where the wetlands and nature conservation areas are. The northern end of the lagoon is called Saldanha Bay ( formerly called Hoedjies Bay) after Antonio de Saldanha, who visited the Cape in 1503. Saldanha never ever saw the bay named after him and he in fact discovered Table Bay. The error came about when the Dutch cartographer Joris van Spilbergen sailed past Saldanha Bay, and mistook it for the bay 'discovered' by De Saldanha, and named it after him. Today the town of Saldanha Bay has been established on the shores of Saldanha Bay. Back in 1503 when van Spilbergen visited the area they found a deep water harbour close to shore and the only thing that stopped them building a harbour there was the fact that there was no fresh water to be found. Because of this ships continued to use Table Bay where they could get fresh water and supplies. Saldanha Bay and its surrounding areas only started to flourish when a pipeline from the Berg River to the town was built and fresh water was no longer a limiting factor. 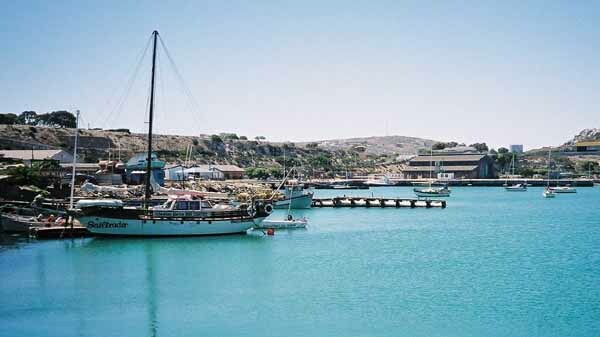 The port at Saldanha is the deepest, and the largest natural port on the South African coastline. It has only recently developed into a modern harbour enabling the export of iron ore from the Northern Cape. The first deliveries of iron ore were exported on the Fern Sea during September 1976. Since then over 400 million tons of ore have been exported. The port has a 990m long jetty containing two iron ore berths linked to the shore along a 3.1km long causeway/breakwater. There is also an 874m long multipurpose quay for the handling of breakbulk cargo and a 365m tanker berth at the end of the ore jetty. To assist with the berthing of the large ships that call at this harbour there are three tugs stationed in the harbour. When ships such as large tankers call at the harbour a tug from Table Bay harbour is sent to assist in the birthing of the ships. The main port is built on the north eastern side of the lagoon. On the west side of the bay is a fishing harbour and along the coastline an artificial breakwater has been built to protect the iron ore harbour from the sea. The town itself has spread itself around the bay with many holiday houses, camp sites being built. The bay is very safe for small craft and is used constantly by fishermen. Because of the wind and relatively flat sea kite boarders and windsurfers flock to the lagoon for their favourite pastimes. The Langebaan/ Saldanha Bay area is one of extreme beauty. When visiting the west coast make an effort to visit the area and see the lagoon for yourself.